« Picture Of The Week. 1927 Douglas With Opposed Twin Cylinder Engine. Published by Cyril Huze February 22nd, 2015	in Builders, Editorial and Events. 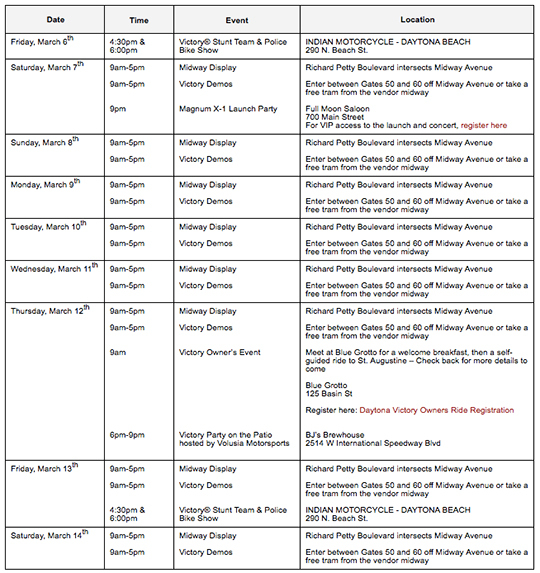 Victory Midway Display – Check out 2015 line-up including the Victory Gunner, Magnum, and Cross Country Tour. Enter to win the 2015 Ness Custom Buffalo Chip Bike at Sturgis, and see other custom Victory bikes within the display. Victory Owners – Don’t forget to pick up your commemorative Daytona pin while you’re there. Victory Demo Area – Throw a leg over one of our 2015 cruisers, baggers, or touring models and feel the rush of the Freedom 106 out on the road. Victory is the #1 performance brand in the American V-Twin market and you’ll see why after a demo. Magnum X-1 Launch – Victory is breaking the sound barrier by announcing the newest addition to the Magnum family at an exclusive Full Moon Saloon Launch Party on Main Street Saturday March 7th. Stay tuned for updates as we get closer to launch. Victory is offering limited VIP access to owners. To attend the launch and get VIP access, register Here. Owner’s Ride & Party – To celebrate all our loyal Victory owners we will be hosting a light kickoff breakfast on Thursday morning and then a self-guided ride to St. Augustine followed by a celebration lunch. Registration Required. Click Here to register. Full schedule after the jump. I saw a leaked photo of the X-1, looks like Victory’s new paint facility is up and running. The pic looked incredible. Anxious to see it in person. AI agree BobS; the paint in the pic looks amazing in that pic. Polaris is now going to be able to paint better than Harley (who does some pretty nice paint). I can’t wait to see what’s coming! ” You are invited ” … well … except the other , much larger and well heeled company and its riders involved thats footing the bill doesn’t think you are … which errr … kind of makes things a little …. awkward ? Hmmmn … chalk another one up to the big dog in town perhaps ? TJ – are you intoning that HD bought a Daytona Sponsorhip to pay for that event? I never saw that press release? They pay for the WHOLE THING? Whew – that will save us some budget. I know that Victory and Indian Motorcycle invite all riders and enthusiasts, no matter their brand of choice, to try our products. They can choose not to also. But that is their choice – and not our nature to exclude. Man I bet Cyril’s going to be bummed when he finds out he’s not allowed to invite one of his readers down to Daytona to win a new Magnum. I guess only H-D and their riders are allowed to do that. Victory when are you going to up date your web page? All the events you have listed is from last year. Am shocked that a billion dollar company can’t have the little things up to date. Hey who won the bike Cyril? The winner will be announced during Daytona Bike Week. Gee, looks like Victory ain’t scared of no “Official Sponsor” !!! Is it just me or do the two links above to register for different events both go to the same registration page?